The Warwick Paris is located in the heart of Paris, just 90 metres from the Champs Elysées and 650 metres from the Arc de Triomphe. 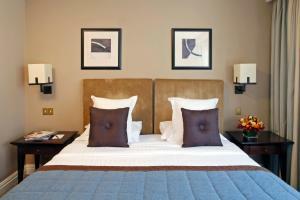 It offers elegantly decorated accommodation, a French restaurant and a lounge bar. 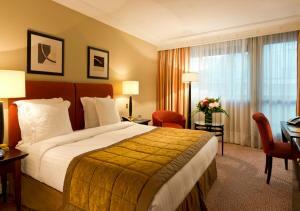 Guest rooms at Warwick Paris are spacious and have floor-to-ceiling windows, which offer plenty of natural light. They feature a flat-screen TV with 38 national and international channels and 82 satellite channels. A kettle, slippers and bathrobes can be provided upon request. Free WiFi access is available at Warwick Paris. There are also car rental and currency exchange services. George V Metro Station is 240 metres from the property and it provides access to Le Louvre, the Jardin des Tuileries and Place de la Bastille. 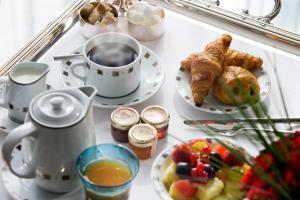 It is just 4 km from the Gare du Nord Eurostar terminal. The reservations are non-transferable to another party. Please note that the restaurant is closed on weekends but guests can have a snack at the bar. Guests are required to show a photo identification and credit card upon check-in. Please note that all Special Requests are subject to availability and additional charges may apply. Decorated in a contemporary style, all rooms are air-conditioned and have a minibar. 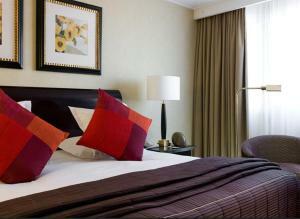 Please note that extra beds and children cannot be accommodated in this room. Rate: € 185.00 ... € 540.00; select dates below to get current rates. Set on the upper floors, these rooms are accessible by a lift and offer a view of the interior garden or Rue de Berri. Decorated in a contemporary style, this room offers air conditioning and a minibar. Extras in the Executive Room include additional space. 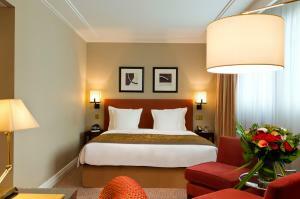 Decorated in a contemporary style, this suite is more spacious and offers air conditioning and a minibar. Extras in the Junior Suite include a small seating area. Decorated in a contemporary style, all rooms are air-conditioned and have a minibar. Extras in this room include a private terrace.